Tobgui Kporku III was a Standing Member of Engineers Association of Ghana, former Ghana’s Ambassador to Japan and Singapore, he also played a major role in the construction of the Keta sea defense project and major highways in the Tema Municipality. The leader of the delegation, Professor Kofi Anyidoho informed the Speaker about the weeklong funeral which will start from 27th August, 2016 at Alakple in the Volta Region. The delegation presented two bottles of schnapps, funeral brochures and two pieces of cloth to the Speaker and Leadership to formally invite Parliament to the funeral. The Speaker thanked the delegates for their visit saying that the late Togbui Kporku III was a man of many parts who was many things to many people. “He says it as it is without any fear, he was affable and always concerned about developmental project not only for his people but the entire nation” said the Speaker. 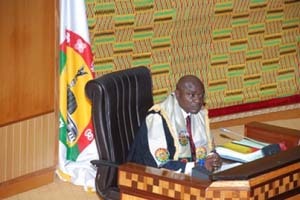 The First Deputy Speaker of Parliament, Ebo Barton-Odro added that his demise should not be mourned but rather celebrated. Both Majority and Minority Leaders described the late Chief as an inspiration to the youth, a very illustrious leader and a bridge between the Northern and Southern sectors of the country.